Known as the Peppercorn tree or ‘Peruvian Peppercorn Tree’, Schinus Molle is found widely in parks and gardens across Eastern and Southern Australia. An evergreen tree with fine weeping foliage which is aromatic when rubbed. The red ‘peppercorns’ follow the flowers which are white to green and insignificant. In the right situation this can make a good shade tree, although it is seen as invasive as the seeds are easily spread by birds. The tree is also best not planted where the fruit and flowers can drop on cars and pathways. Tolerant of drought and hot dry summers it has been widely grown, in both urban and rural landscapes. Sometimes called the False Peppercorn tree, Schinus molle is a South American species that has been grown as a landscaping and shade tree four many years. 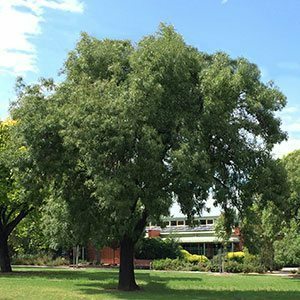 Used widely as a street tree as well as in parks and gardens, it is low maintenance and drought tolerant once established. Over time Schinus molle will reach around 10 metres (30ft) in height with a spreading grown to 8 metres. As with all tree growth rate will vary depending on soil and climate, however it is regarded a medium to fast. The foliage is a mid to deep green, and lance shaped, serrated on the leaf margins. Overall the foliage develops an attractive slightly weeping habit.